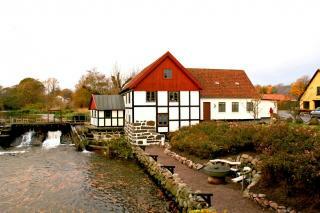 In 1640, a watermill was built where Sæby River runs into the Kattegat. The mill belonged to the King for two periods during the 17th century. Otherwise it belonged to Sæbygård until 1747. Elisabeth Bille rebuilt the grain mill in 1710 and was permitted to charge a toll to cross the mill dam. The mill was in operation right up until 1930. As late as in 1921, the waterwheels were replaced with a turbine that produced power for the property until 2003. Today, the property is used for housing and is the focus of a heated discussion. The turbine may no longer be used and anglers' organisations want the dam removed. In the 17th century, society was divided into social classes that were considered preordained by God. There was a world of difference between a miller's life and the life of a King with absolute power. Even so, the miller was permitted direct contact with his monarch and the owner of the mill. When Sæby Watermill was destroyed by sand drifts in the 1690s, miller Anders Oloffsen wrote to King Christian V in 1698. Oloffsen offered 35 rix-dollars per tønde hartkorn" (one tønde is about 1.363 acres and a hartkorn is a Danish unit of land valuation) for the mill. The miller's letter began: "Highest and Mightiest Gracious Hereditary King and he signed the letter, "Your Royal Majesty's most subservient faithful hereditary subject". His deference was in vain, however, as the King did not sell the mill to his hereditary subject but put it up for auction. "